Lady of the Lake ©2015 - According to legend, the Lady of the Lake lived beneath the waters surrounding the mystical island of Avalon. This "Lady of the Lake" is comprised of 10 different images. The base image is from a trip to The Great Swamp in New Jersey in 2011. It's not Avalon, but quite beautiful in it's own right. I've tried using it in 2 other compositions before but nothing really came together until now. The lovely lady is from my vintage photo collection and fit in perfectly. I added a different sky with more interesting clouds and a full moon along with several crows flying into the distance. 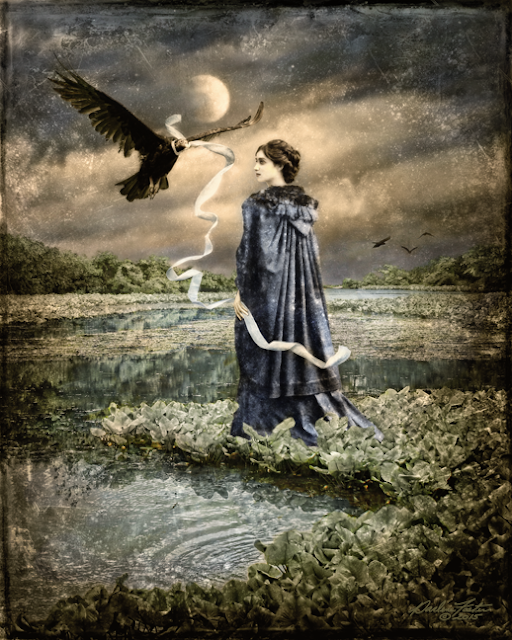 Instead of Merlin, my Lady of the Lake has enchanted a vulture to do her bidding and tethered him with a leash of pale blue ribbon. Numerous filters were added in the appropriate places for colors and tones along with texture from an old daguerreotype bringing all the elements together for the final piece.